This whole ranking is far from hard science, but it gets even worse when trying to figure out who slots in to what starter role. I did my best to keep it to what I think is the most likely rotation for each team, and if the order changes, it will affect the points given. But such is life, we forge ahead. Interestingly enough, Scherzer and Harvey are projected by BP to have almost identical ERAs. But the strikeouts and the extra innings give Scherzer the edge, and then when you realize the park effects make the difference a little bit bigger, you understand why they see Scherzer as nearly a full win higher. Is it possible that Fernandez is better than both of them? You bet, he’s a legit Cy Young candidate, but he’s coming back from TJ surgery, so he goes behind those other legit candidates. 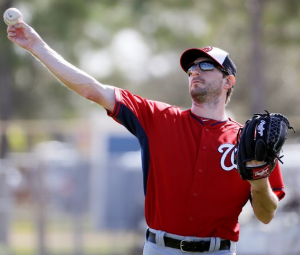 Like Harvey and Fernandez, Scherzer will Hypnotize guys with incredible hard stuff, and then make them look foolish with breaking stuff. Teheran doesn’t have the velocity of the other top guys, but he still could be really good. Jeremy Hellickson is the Phillies number one starter, for some reason. Strasburg was better in the last third of the season in 2015 than deGrom, but he was either way worse or not playing in the previous 2/3. A healthy Strasburg may just edge out deGrom, but deGrom’s good enough that I’m not even completely positive about that. But, despite BP projecting identical WARPs from the two, the lingering health questions on Strasburg and the insane abilities of deGrom put me in a N.Y. State of Mind. If Strasburg continues his pitching from the second half of last season, he’ll end up with better numbers than deGrom, but the Mets starter is more likely to have a better season over 32 starts. Chen is a decent enough pitcher, but is really a solid mid-rotation start going up against those two potential aces. Aaron Nola might be the best pitcher on the Phillies staff, which probably still doesn’t make him an ace, and he’s still gotta show what he can do at the Major League level. You guess is as good as mine on the Braves rotation, but I’ve seen a couple of places call Wisler their #2, so I’m going with it. I was a bit surprised to see that BP gives the top two here identical WARPs as well. It’s mostly because despite Syndergaard’s better projected ERA, they see a bigger chunk of innings for Gio, and innings are useful. But Syndergaard was really good last season, and with the kind of stuff he brings, I think it’s a pretty Sure Shot that he’ll be the best one here. The Nats probably benefit from one point for one position here – Syndergaard, despite those projections, is much better than Gio right now. But the rest of the league probably can’t hang with Gio. Eickhoff had a really good run at the end of last season in a short amount of time, and is certainly one of the Phillies best starters. Koehler was considered the first non-Fernandez/Chen starter to have locked in a rotation spot, not that he’s anything special, but he’s probably better than Norris. Joe Ross was really good last season, although if we’re going with stuff alone, Matz has the edge. But Don’t Sweat the Technique too much – Ross has killer stuff himself, and Matz has never been able to stay completely healthy. Matz is a few years older, is certainly ready, and he’s a really good pitcher. But I think it’s likely that most of his numbers will beat Ross’s, but until he shows he can stay healthy, I think Ross will beat him enough in the innings category to make the difference. Jarred Cosart is probably the Marlins third best starter, even though Koehler was named the #3 guy. Charlie Morton is a perfectly cromulent innings eater, who might be alright as 5th starter type, but really shouldn’t be counted on for more than that. Chacin could conceivably be better than both of them – he’s certainly shown some of that ability in the past, but coming back from injury on top of his very up and down career make him a longer shot. 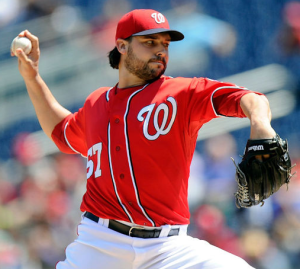 Roark was one of the coolest stories of 2014, and after a lost 2015, the Nats are betting on the Rebirth of Cool. Even if he’s not great, there isn’t a ton of competition at this point. Bartolo Colon is a super fun player to watch, and he eats innings so well that there’s a good joke there that I don’t feel like making. But he’s managed an 86 ERA+ over the last two seasons. Is Roark better than that? Probably, but if he’s not, I’m almost positive Giolito is. If Wheeler was pitching all season, I’d probably put him up top, but he’s slated to miss half the year, so I can’t imagine he’d bring enough value over the course of the season. The rest of the league is sort of a mess at the position, but a few of the guys have looked pretty good so far this spring. Good luck guessing which of the bottom three will top the group, and neither have a Giolito or Wheeler ready to go. The only team here with any real stability at the closer position is the Mets. Familia is the closer and will be the closer. A.J. Ramos was great in 2015, and was basically part of an interchangable setup-closer combo before Capps got hurt. That injury isn’t good for the Marlins, but for the specific closer position, Ramos still brings it. Papelbon, despite all his annoyances and his desire to Regulate behavior in the clubhouse, is still pretty damn good. Grilli might not be ready in time, but it’s supposedly his job. Vizcaino will probably be the closer by the end of the season, and is better than Papelbon, but I don’t think he’ll get all the save chances this year, so that limits his value. The two guys I named for the Phillies might not even end up closing – heck, Bailey hasn’t even officially made the team, but they’ll run someone out there. So, there you have it, the Mets take the division by a little less than a game and a half! Ok in all seriousness, this doesn’t surprise me greatly. The Mets and the Nats should be neck and neck all season, and on paper, the Mets look a little bit better. 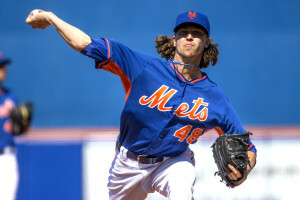 The front end of the Mets pitching staff should look better than the Nats. 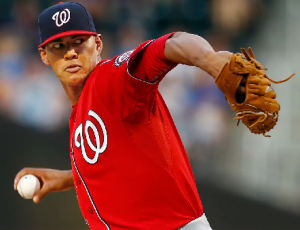 The Nats should have a slightly better lineup, and probably more success in the back of the rotation – even if not, the Nats rotation might still be top 5 in the league, so the differences should be great. 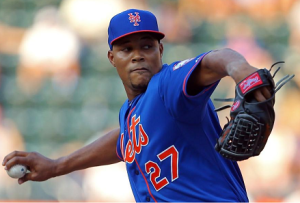 What surprised me was how good the Mets lineup looked, and how questionable the back of their rotation might be. So what could shake this scenario loose from being a virtual tie? Well, it sort of has great seasons from deGrom and Syndeergard built in, so maybe they aren’t so great. Of course, if Matz can throw 200 innings, and Wheeler comes back July 1 with guns blazing, that could shift the balance there. What if besides Bryce being great, Rendon has an MVP season? 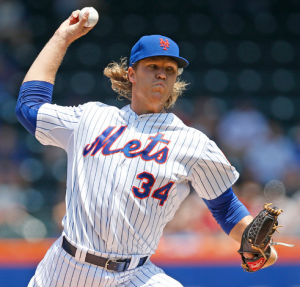 Or Syndergaard wins a Cy, while Harvey and deGrom are both as good as we expect? What’s maybe most fun/interesting to me is that both teams are close enough that a couple of wild card players like Giolitio, Taylor and Turner on the Nats, and Matz, Wheeler and Conforto on the Mets could make a huge difference. In addition, you could see big contribution from the bench, and the Nats might be at an advantage running out Taylor and Robinson, where the Mets might play a bit too much of De Aza and Legares. Then again, the Mets bullpen might be more reliable than the rebuilt Nats. The Phillies and the Braves are unsurprisingly low, the Marlins, maybe more surprising to some. But I just don’t think they have the horses to hang with the Mets and the Nats, and will end up with another sub-.500, 3rd place finish. It seems the Nats are pretty dependent, from these rankings, on guys who had pretty bad 2015s recovering to near-2014 levels, whereas the Mets are reliant on young pitchers with dominant stuff repeating their 2015 performances. I’m sure neither team will get to these goals at 100%, so I guess how close each gets may be the determining factor. Either way, it should be an incredible, and most likely two-team, race this season. Thanks much for this super article and your analysis. As a Nats fan I hope the Nats do at least as well as you predict.